Martin Van Buren, eighth president of the United States, was born at Kinderhook, New York, on the 5th of December 1782, of Dutch descent. His father was a farmer and tavern-keeper. His education was limited to that which could be obtained in the common schools and at Kinderhook Academy, and there is testimony to the effect that as late as 1829, when he became secretary of state, he wrote crudely and incorrectly. In 1796 he began the study of law, completing his preparation in 1802 at New York, where he studied under William Peter Van Ness (1778-1826), an eminent lawyer and later Aaron Burr's second in the duel with Alexander Hamilton. Van Buren made the acquaintance of Burr, but did not fall under his influence. In 1803 he was admitted to the bar and continued in active and successful practice for twenty-five years. His practice made him financially independent, and paved the way for his entrance into politics. New York politics after 1800, the year of the election of Thomas Jefferson and the downfall of the Federalists, were peculiarly bitter and personal. The Republicans were divided into three factions, followers respectively of George Clinton (and later of his nephew, De Witt Clinton), Robert R. Livingston and Aaron Burr; and such Federalist control as there was from time to time after 1799 depended upon coalition with one or other of these groups. Van Buren, who early allied himself with the Clintonians, was surrogate of Columbia county from 1808 until 1813, when he was removed. In 1812 he entered the state Senate, and he also became a member of the court for the correction of errors, the highest court in New York until 1847. His career in the Senate covered two terms (1812-20). In 1815 he became attorney-general, an office which he held, still as a member of the Senate, until 1819, when he was displaced to make room for a Federalist. He had already, in 1808, removed from Kinderhook to Hudson, and in 1816 he took up his residence in Albany, where he continued to reside until he entered Andrew Jackson's cabinet in 1829. As a member of the state Senate he supported the War of 1812 and drew up a classification act for the enrolment of volunteers. He was chosen to draft the resolution of thanks voted by the legislature to General Andrew Jackson after the battle of New Orleans. He broke with De Witt Clinton in 1813, but nevertheless favored, in 1817, Clinton's plan for the Erie Canal. His attitude towards slavery at the moment was shown by his vote, in January 1820, for a resolution opposing the admission of Missouri as a slave state. In the same year he was chosen a presidential elector. It is at this point that Van Buren's connection began with so-called "machine politics", a connection which has made his name odious to some historians of the period. He was a leading member of the "Albany regency", a group of politicians who for more than a generation controlled the politics of New York and powerfully influenced those of the nation, and which did more than any other agency to make the "spoils system" a recognized procedure in national, state and local affairs. 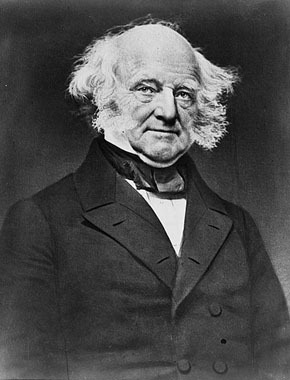 Van Buren did not originate the system, for it was already well-developed when he entered public life; but the nickname of "Little Magician" which presently attached to him testifies to the skill with which he exploited it, and to the popular impression which his political methods produced. In February 1821 he was elected to the United States Senate. Before taking his seat he served also as a member of the state constitutional convention, where he opposed the grant of universal suffrage. His course in the Senate was not altogether consistent, though in this respect he is not to be judged more harshly than some of his associates. He at first favored internal improvements, and in 1824 proposed a constitutional amendment to authorize such undertakings, but the next year took ground against them. He voted for the tariff of 1824, then gradually abandoned the protectionist position. In the presidential election of 1824 he appeared as a strong supporter of William H. Crawford, and received the electoral vote of Georgia for Vice President; but he shrewdly kept out of the acrimonious controversy which followed the choice of John Quincy Adams. He early recognized the availability of Andrew Jackson, however, as a presidential candidate, and after the election sought to bring the Crawford and Jackson followers together, at the same time strengthening his control as a party leader in the Senate. Always notably courteous in his treatment of opponents, he showed no bitterness either towards J. Q. Adams or Henry Clay, and voted for Clay's confirmation as Secretary of State notwithstanding the "corrupt bargain" charge; at the same time he opposed internal improvements and declined to support the proposal for a Panama Congress. As chairman of the judiciary committee, he brought forward a number of measures for the improvement of judicial procedure, and in May 1826 joined with Thomas Hart Benton in presenting a report on executive patronage. In the debate on the "tariff of abominations" in 1828 he took no part, but voted for the measure in obedience to instructions from the New York legislature -- an action which was cited against him as late as the presidential campaign of 1844. Van Buren was not an orator, but his more important speeches show careful preparation and his opinions carried weight; and the oft-repeated charge that he refrained from declaring himself on crucial questions is hardly borne out by an examination of his senatorial career. In February 1827 he was re-elected to the Senate by a large majority. He was now one of the recognized managers of the Jackson campaign, and a tour of Virginia, the Carolinas and Georgia in the spring of 1827 won support for Jackson from Crawford. In 1828 Van Buren was elected governor of New York for the term beginning on the 1st of January 1829, and resigned his seat in the Senate. But on the 5th of March he was appointed by President Jackson as secretary of state, an office which probably had been assured to him before the election, and he resigned the governorship. As secretary of state he took care to keep on good terms with the "kitchen cabinet", the group of politicians who acted as Jackson's advisers, and won the lasting regard of Jackson by his courtesies to Mrs. John H. Eaton, wife of the secretary of war, with whom the wives of the cabinet officers had refused to associate. He did not oppose Jackson in the matter of removals from office, but was not himself an active "spoilsman", and protested strongly against the appointment of Samuel Swartwout (1783-1856), who was later a defaulter to a large amount as collector of the port of New York. He skilfully avoided entanglement in the Jackson-Calhoun imbroglio. No diplomatic questions of the first magnitude arose during his service as secretary of state, but the settlement of long-standing claims against France was prepared for, and trade with the British West India colonies was opened. In the controversy with the Bank of the United States he sided with Jackson. After the breach between Jackson and Calhoun, Van Buren was clearly the most prominent candidate for the vice-presidency. Jackson in December 1829 had already made known his own wish that Van Buren should receive the nomination. In April 1831 Van Buren resigned, though he did not leave office until June. In August he was appointed minister to England, and arrived in London in September. He was cordially received, but in February learned that his nomination had been rejected by the Senate on the 25th of January. The rejection, ostensibly attributed in large part to Van Buren's instructions to Louis McLane, the American minister to England, regarding the opening of the West India trade, in which reference had been made to the results of the election of 1828, was in fact the work of Calhoun, the Vice President; and when the vote was taken enough of the majority refrained from voting to produce a tie and give Calhoun his longed-for "vengeance." No greater impetus than this could have been given to Van Buren's candidacy for the vice-presidency. After a brief tour on the Continent he reached New York on the 5th of July. In May the Democratic convention, the first held by that party, had nominated him for vice-president on the Jackson ticket, notwithstanding the strong opposition to him which existed in many states. No platform was adopted, the widespread popularity of Jackson being relied upon to win success at the polls. His declarations during the campaign were vague regarding the tariff and unfavourable to the United States Bank and to nullification, but he had already somewhat placated the South by denying the right of Congress to abolish slavery in the District of Columbia without the consent of the slave states. In the election he received 189 electoral votes, while Jackson received 219 for President. Jackson now determined to make Van Buren president in 1836, and bent all his energies to that end. In May 1835 Van Buren was unanimously nominated by the Democratic convention at Baltimore. He expressed himself plainly during the canvass on the questions of slavery and the bank, at the same time voting, perhaps with a touch of bravado, for a bill offered in 1836 to subject abolition literature in the mails to the laws of the several states. Calhoun, bitterly hostile to the last, objected to the usual vote of thanks to the retiring vice-president, but withdrew his objection. In the election Van Buren received 170 electoral votes against 73 for William Henry Harrison, his principal opponent; but the popular vote showed a plurality of less than 25,000 in a total vote of about 1.5 million. The election was in fact a victory for Jackson rather than for Van Buren. The details of Van Buren's administration belong to the history of the United States. He announced his intention "to follow in the footsteps of his illustrious predecessor", took over all but one of Jackson's cabinet, and met with statesmanlike firmness the commercial crisis of 1837, already prepared for before he took office. No exhibition of ability or courage, however, nor yet the most skilful manipulation of the political machinery of the party, could prevent continued hostility to him and to the methods for which he was widely believed to stand. The state elections of 1837 and 1838 were disastrous for the Democrats, and the partial recovery in 1839 was offset by a second commercial crisis in that year. Nevertheless, Van Buren was unanimously renominated by the Democrats in 1840. Charged with being "a Northern man with Southern principles", he was frequently interrogated during the campaign, and his nomination obviously failed to arouse enthusiasm or even inspire confidence. The revolt against Democratic rule was undoubtedly serious, but a study of the popular vote shows that the election of Harrison, the Whig candidate, was less of a revolution than many affected to think. On the expiration of his term Van Buren retired to his estate at Kinderbook, but he did not withdraw from politics or cease to be a figure of national importance. It was even proposed to make him a member of the Federal Supreme Court in order to get him out of political life. He confidently expected to be nominated for president in 1844, and his famous letter of the 27th of April, in which he frankly opposed the immediate annexation of Texas, though doubtless contributing greatly to his defeat, was not made public until he felt practically sure of the nomination. In the Democratic convention, though he had a majority of the votes, he did not have the two-thirds which the rule of the convention required, and after eight ballots his name was withdrawn. In 1848 he was again nominated, first by the "Barnburner" faction of the Democrats, then by the Free Soilers, with whom the "Barnburners" coalesced, but no electoral vote was won by the party. In the election of 1860 he voted for the fusion ticket in New York which was opposed to Abraham Lincoln, but he could not approve of President James Buchanan's course in dealing with secession, and later supported Lincoln. He died in Kinderhook on the 24th of July 1862. His memoirs, to 1834, remain unpublished, but an Inquiry into the Origin and Course of Political Parties in the United States was compiled from it by his sons and published in 1867. Van Buren married in 1807 Hannah Hoes (1782-1819), by whom he had five sons. Van Buren's son Abraham (1807-1873) graduated at West Point in 1827, served under General Winfield Scott against the Seminole Indians in 1836, and was made captain of the First Dragoons. In 1837 he resigned from the army to become his father's private secretary, but in 1846, at the outbreak of the war with Mexico, he was reappointed with the rank of major and paymaster. In August 1847 he was breveted lieutenant-colonel for gallant and meritorious conduct at Contreras and Churubusco. In 1854 he retired to private life. Another son, John (1810-1866), graduated at Yale in 1828, was admitted to the bar at Albany in 1830 and was Attorney General of New York in 1845-1846. He was popularly known as "Prince John" because of his manners and appearance.